Exposure: 15 min at f/2,8. Comments: I developed the Film in a print developer, which resulted in very hight contrast. The hight contrast is good for the comet, but it enhances the vignetting very much. I used my Super Polaris mount, without guiding corrections. I lined out the big dipper, to give you a scale of perspective on the lenght of comet Hyakutakes tail. At the point, where the tail intersects with the handle of the big dipper a patch can be seen. 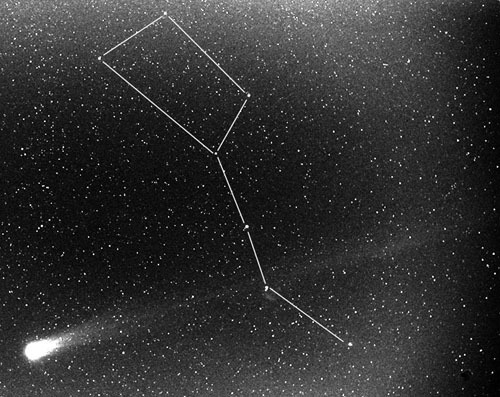 It seems that it represents a part of the comet, which disconnected earlier. This entry was posted in C/1996 B2 Hyakutake.